​From clay tablets to the printing press. From the Epic of Gilgamesh to Harry Potter. This is the true story of literature and how it shaped people, history, civilization​. "Every page is worth reading . . . The Written World has revived my interest in literature." Elfen S. Cruz, The Philippine Star. The Written World--the book on President Clinton's night stand . . .
"It's literature not as mirror, then, but as potent force. What could be more important?" Library Journal, Barbara's Non-Fiction Picks. Puchner tells the story of literature as a mobile, constantly mutating, entity. His telling grip[s] the reader . . .vividly dramatized. . . at the end, the image that abides is that of Ann Akhmatova who wrote, memorized and burnt her poems, and entrusted her female friends with the same responsibility." Telegraph India. "brilliant and ambitious . . . painstakingly researched . . . Puchner's chapters . . . are fascinating for their transportive quality. . . . A great reading experience. Aqsa ljaz, Dawn. -BBC conversation with Richard Holloway, former Bishop of Edinburgh, about The Written World. - WICN "The Public Eye"
- WFOV "The Tom Sumner Program"
- WRFK "The Jim Engster Show"
- Kansas Public Radio, "Perspectives"
- WBZ "Up Front with Chris Citorik"
- WJFF "Catskill's Review of Books"
- Sioux City Public Radio "The Exchange"
- WTBS "On the Bookshelf"
- KRCB "A Novel Idea"
- KSCJ "Having Read That"
- WOMR "The Lowdown with Ira Wood"
- Blogtalk Radio "Conversations Live!" - KGNU "It's the Economy"
- WOMM "Write the Book"
- WGNA "Speaking of Writers"
- KSFR "The Last Word"
- KCUR "Up to Date"
​- Kansas Public Radio "Conversations"
China, Taiwan, Japan, Korea, Brazil, Portugal, Spain, Latin America, France, Italy, Germany, Czech Republic, Turkey, Romania, Ukraine, Slovenia and Russia. Tell us how THE WRITTEN WORLD came to be. I’d have to go back to the early 2000s, when people began spending more time online, and all around me were these complaints that students weren’t reading anymore, that they were only interested in the Internet, in online games, or, a little later, in binge-watching Netflix and checking Facebook. I started to worry myself. But at some point, I thought: wait a minute. Here are people writing as never before, writing everything from emails and online reviews to blogs and self-published romances, so much so that “text,” for the first time in the history of the English language, was becoming a verb. All this technological change couldn’t be all bad. I began studying how technologies have impacted storytelling in the past and in different places, from African storytellers to Japanese court poetry. I loved the sense of discovery, texts from distant lands that had somehow made it into my hands. But the more I read, the more disoriented I became. Where had all this literature came from and how had it survived? Before I knew it, I was in the process of trying to piece together a story: the story of literature. I was not an avid reader growing up. I would take a pile of books with me on family vacations and make my way through them, but mostly to kill time. I was fond of The Lord of the Rings, which I read several times until I knew its strange world by heart. In school, I studied Latin, French, and English from an early age and I remember the pleasure, after months messing around with simple sentences like “Hello, my name is Martin,” of piecing together the meaning of a real sentences, reading a first story, grasping a first glimmer of style. Languages with different scripts were even more exciting because reading them felt like deciphering a secret code. I first got a taste of this with Greek and later taught myself the Hebrew script to read Yiddish. Having grown up in Germany and spending summers in England and the US during high school--at language camps, with family friends, taking summer courses--I moved to the US and began to make English my home. I write and think differently in English because languages bring with them entire cultures and their ways seeing the world. Speaking and writing in another language is a strange process of self-transformation, awkward at first, but then exhilarating because it opens up possibilities you never knew existed. Looking back, I think all of this got me interested in literature from far afield—world literature. Teaching world literature has given me the opportunity to teach in different countries, from Brazil to Beirut and from China to Norway, and to collaborate with scholars internationally. It was also what attracted me to Harvard, where I’ve worked with terrific colleagues on all kinds of world literature projects, from general education and online courses to summer programs and anthologies. World Literature has allowed me keep discovering something new every single day. It’s intoxicating and I never want to stop. Why is it so important for us to understand the role literature has played in great historical events? Once I started looking for the impact of written stories, I found it everywhere. Take our last two presidents. Both launched long-shot campaigns against entrenched political dynasties, and they couldn’t have done it without their best-selling books, The Art of the Deal and Dreams from My Father. It was through these books that they introduced themselves to a larger public, shaping who they were and how they wanted to be perceived. In doing so, they drew on a specifically American tradition of autobiography that goes back to Benjamin Franklin. The reason why I didn’t always recognize the full impact of literature was because I tended to think of literature only in terms of what was on the fiction shelves. But once I broadened the definition of literature to include all significant written stories, I began to see their influence in many places. Most of today’s dominant cultures are based on sacred texts like the Bible, the Qur’an, the sayings of Confucius or Buddha, and modern texts like the Declaration of Independence or the Communist Manifesto—how some texts became sacred is itself a fascinating story I tell in the book. At the same time, we’re experiencing an explosion of new literature right now. Much of what we see on film, television, and the new media draws on previously written stories. By the end of my research, I realized that there has never been a time when literature was more important than today. Of the many writers and storytellers you describe in THE WRITTEN WORLD, which ones are especially dear to you? Lady Murasaki is the first author who comes to mind. Every time I read her work and think about her life, I find myself deeply touched by her perseverance. A Lady-in-Waiting at the Japanese court during the Middle Ages, Murasaki lived an extremely restricted life, mostly confined to interior chambers—we don’t even know her real name. She had to acquire proficiency in Chinese literature in secret. Yet out of those constraints she wrote the first major novel in history, which gives us unparalleled access to the inner lives of her characters. Another is the Popol Vuh, the Mayan epic that tells the story of the creation of the earth and features fantastic trickster twins. There was no contact between Eurasia and the New World since the invention of writing, so we know for sure that Maya literature developed completely independently, and that humans invented writing, perhaps the most important invention in our entire history, at least twice. The Popol Vuh was almost lost when Spaniards arrived in the New World and begun to burn Maya books. A single copy survived because Maya scribes went underground. Finally, there’s Anna Akhmatova, the Russian Sappho as she was sometimes called, who lived under Stalin and couldn’t publish her work. Instead of giving up, she composed poetry in secret and recite her poems to her friends, until they knew them by heart. She called her situation “pre-Gutenberg”—censorship forced her to live as if the printing press had never been invented. In those trying circumstances, she produced some of the most important poetry of the twentieth century. Literature's "canon" is always a controversial topic. As a literature scholar whose work makes sense of how literature has evolved, how do you decide what to include in your textbooks and syllabi? This is a question that first came up when I edited the Norton Anthology of World Literature. Even though we had 6000 pages across six volumes, it was incredibly hard to decide what to include and what to exclude, balancing well-known works with masterpieces from ancient and modern times that were less known, and featuring new authors and texts that were only now gaining tracking or that we felt had been overlooked. Canons change all the time: it’s a very dynamic process. The most important part was talking to teachers and students who actually use the anthology. Many colleges and universities that have large world literature programs are in the south, in places such as northern Alabama or southern Georgia, so this was an opportunity for me to travel to places I had not been before. To prepare me for one such visit, the organizer simply sent me a copy of Garden & Gun. At another time, I found myself paddling around alligators in Okefenokee, in Florida. You wouldn’t know this by reading the usual accounts about rural America, but world literature is thriving in the heartland. This experience changed how my team and I shaped the anthology. For example, it prompted us to include more religious and philosophical texts. Buddha, Jesus, and Confucius are as important as Homer or Virgil. I also found it rewarding to teach world literature to students who may not have had a chance to traveled much, who may not own a passport. World literature can be accessed from everywhere. It provides its own, special opportunity for encountering other cultures and to think about your own. The whole experience of shaping the canon of world literature then fed into the process of writing THE WRITTEN WORLD. You teach an incredibly popular and innovative HarvardX MOOC for people all over the world. What is a MOOC, and what's been most surprising or rewarding about teaching this one? MOOC stands for massive, open online courses, courses developed for online streaming and online platforms that anyone can take for free. Creating a MOOC allowed me to interact with a large range of people from all kinds of places. It took years to make, but the process was rewarding. I brought a camera—and sometimes a camera person—to many places I visited for THE WRITTEN WORLD, so there’s lots of live footage from Troy and Istanbul to the Jaipur Literary Festival in India. We also added studio discussions with experts, translators, and authors, and online features including quizzes, annotation tools, and discussions. It is exhilarating to engage with participants from more than 160 countries. Currently, the largest group, over 1,000, comes from Brazil, but there are participants from everywhere, including places like Mongolia, Yemen, or Syria. Students from countries that are currently at war with each other meet in our discussion groups, exploring the role of foundational texts for different cultures. The course definitely has a United Nations feel to it, which I find very moving. In THE WRITTEN WORLD, I describe how the term “world literature” was coined by Goethe in the 19th century as an alternative to the intense nationalism prevalent at the time. Nationalism seemed to him too narrow, too provincial, too nostalgic about the past. We are currently living through another era of nationalism, which Goethe would have rejected for the same reasons. Goethe thought of world literature as an antidote—which is as true today as it was then. 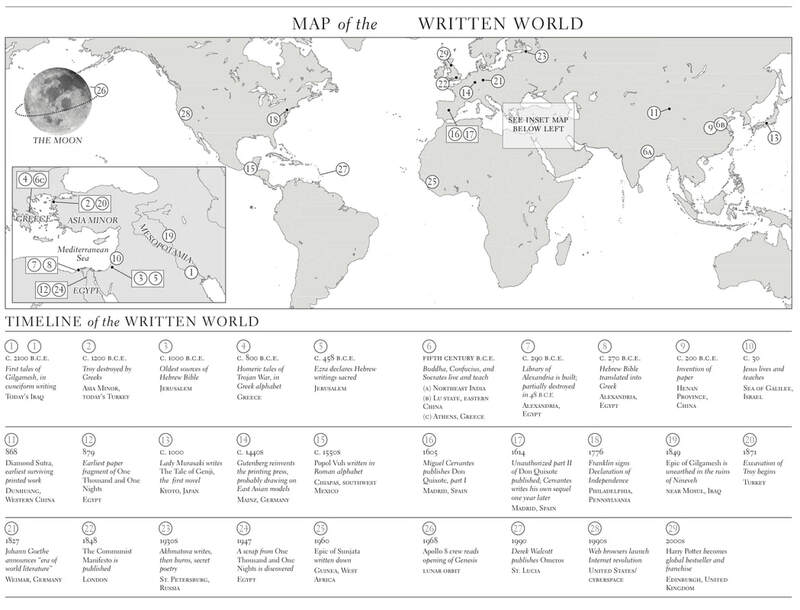 THE WRITTEN WORLD chronicles not just the impact of some of the most important stories in world literature, but is a bit of a travelogue as well. Tell us more about the role travel and visiting new places played in your research. I felt in order to write about the impact of literature on the world, I couldn’t just sit in my armchair. On my travels, I came across many ruins from ancient civilizations that were connected to literature—libraries; theaters; temples. These civilizations had spent enormous resources to literature. Travel also made me realize how much we experience the world through stories. When I first went to St. Lucia, for example, I found that Derek Walcott’s poetry and plays were constantly on my mind. And it wasn’t just me. Many inhabitants I met had incorporated his work into how they saw their island. St. Lucia became a microcosm for the enormous impact literature has had on our view of the world. What's something your readers would be surprised to learn about you? When I was growing up, my uncle became obsessed with a secret language, a language of the underground that had existed for hundreds of years, based on a mixture of Yiddish, German, and Hebrew. Using words from that language, called Rotwelsch, became something of a family pastime. He died in his 40s, but when I went off to college and became interested in literature myself, I went to my aunt and she gave me boxes and boxers of notes, manuscripts, and other materials. I realized that my uncle was trying to turn this thieves’ argot into a legitimate language by translating into it works of world literature—parts of the Bible, Don Quixote, and Shakespeare. Growing up, this seemed completely normal to me; only later did I realize that this was a strange family inheritance. I also have a background in theater, and just founded a program, Theater, Dance, and Media, at Harvard (https://tdm.fas.harvard.edu/). For a long time, I thought of this program as completely separate from my passion for world literature. I don’t know why it took me so long to realize that this program and the book I was writing were quite closely connected—they are both focused on storytelling through different media. To book an interview with Martin Puchner, or to request additional galleys of THE WRITTEN WORLD, please contact Lucy Silag at 212/366-2976 or lsilag@penguinrandomhouse.com.